According to RealtyTrac's U.S. Foreclosure Market Report for January 2015, foreclosure filings (default notices, scheduled auctions and bank repossessions) were reported on 119,888 U.S. properties in January, an increase of 5 percent from the previous month but still down 4 percent from a year ago. The 5 percent monthly increase was driven primarily by a 55 percent monthly jump in bank repossessions (REOs) to a 15-month high. 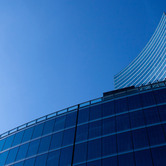 A total of 37,292 U.S. properties were repossessed by lenders in January, up 23 percent from a year ago to the highest monthly total since October 2013. "The year-over-year increase in REOs in January was the first annual increase nationwide following 25 consecutive months of declines, getting the foreclosure spring cleaning we anticipated in our last foreclosure report off to a quick start in 2015," said Daren Blomquist, vice president at RealtyTrac. 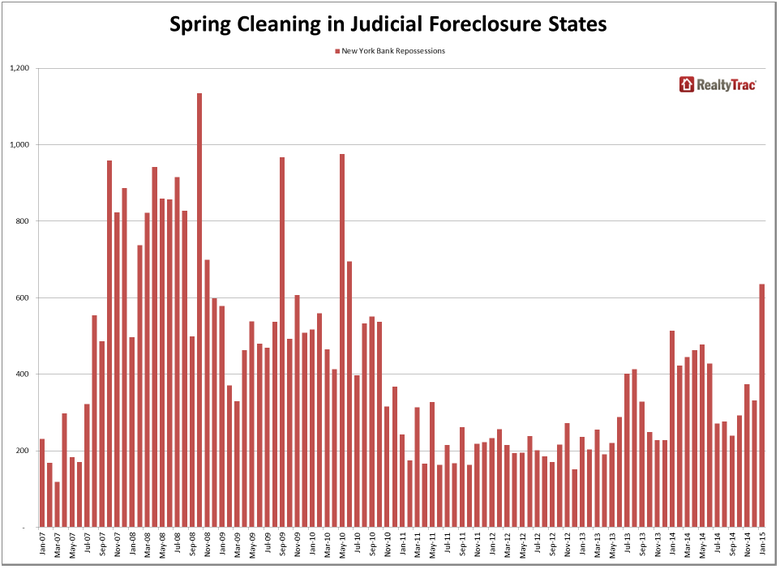 "Meanwhile, the number of future foreclosure auctions scheduled in January continued to increase in many states, foreshadowing more foreclosure spring cleaning to come in the next several months in those states." Twenty-one states posted a year-over-year increase in scheduled foreclosure auctions in January, including Massachusetts (up 268 percent), New Jersey (up 125 percent), North Carolina (up 111 percent), New York (up 79 percent to a 55-month high), Missouri (up 74 percent to a 29-month high), California (up 43 percent to a 22-month high), Arizona (up 37 percent to a 20-month high), Oregon (up 29 percent), and Washington (up 13 percent). "There has been a slow but persistent increase in new foreclosure filings in the seven front-range counties in Colorado," said Greg Hagan, owner/broker at RE/MAX Alliance, covering the Denver market, where scheduled foreclosure auctions in January jumped 166 percent from December and were up 14 percent from a year ago. 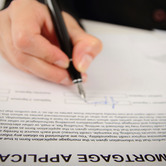 "It appears that a number of these new filings are in fact re-filings with new law firms who took over the business after the bad-actor law firms were eliminated. 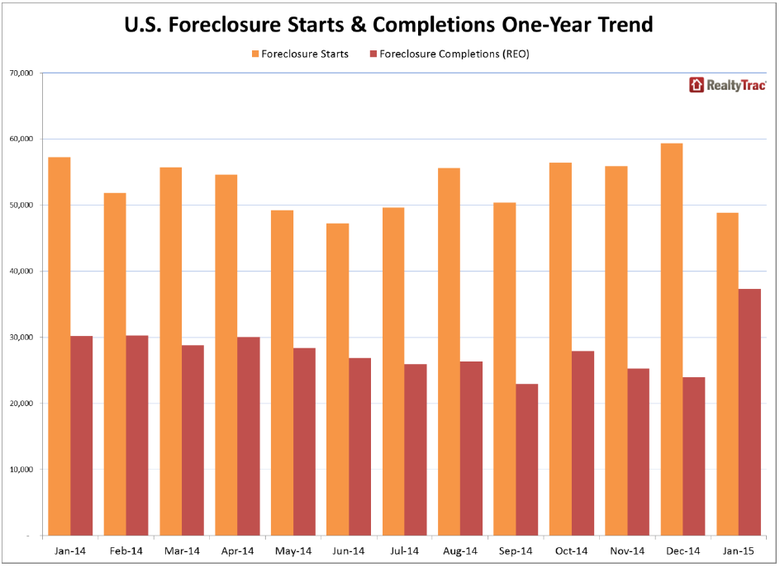 Many of these new filings have been in foreclosure limbo for more than a year and are now coming to sale in 2015. 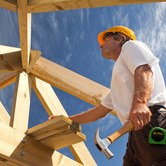 There does appear to be upcoming opportunities for short sales and REO business despite our strong local market where inventory is in short supply." 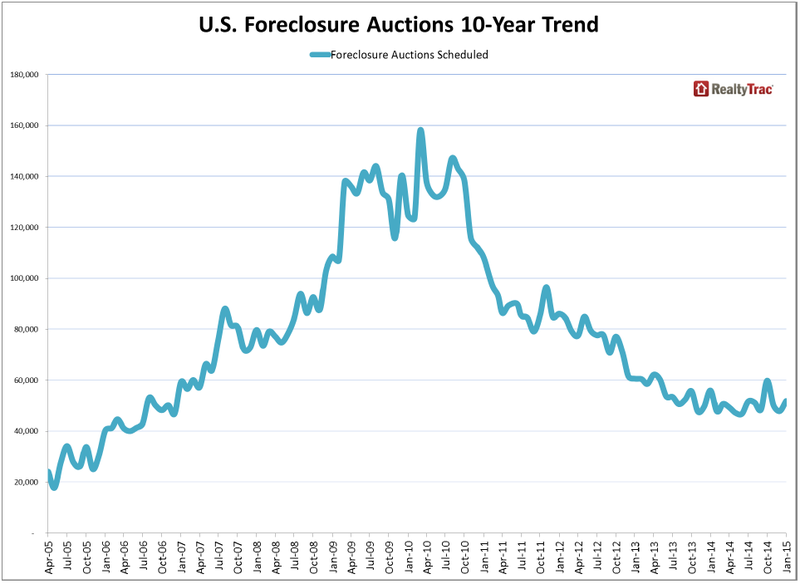 "It's important to note that in most of these states, foreclosure auctions and REOs are coming off somewhat artificially low levels last year and are still far below the highs reached during the worst of the foreclosure crisis back 2009 and 2010," Blomquist noted. A total of 51,782 U.S. properties in January were scheduled for a future foreclosure auction, up 8 percent from the previous month but still down 7 percent from a year ago and down 67 percent from the peak of 158,105 in March 2010. 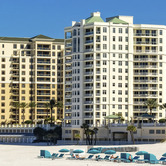 U.S. REOs in January were down 63 percent from a peak of 102,134 in September 2010. Twenty-seven states posted annual increases in REOs in January, including Ohio (up 197 percent), New Jersey (up 116 percent to a 51-month high), Maryland (up 100 percent), Washington (up 75 percent to a 39-month high), Arizona (up 61 percent to a 20-month high), California (up 58 percent to a 24-month high), Pennsylvania (up 44 percent to a 42-month high), Michigan (up 39 percent to a 16-month high), North Carolina (up 38 percent to a 15-month high), Texas (up 24 percent to a 16-month high), New York (up 24 percent to a 55-month high), and Florida (up 17 percent). "Due to our ponderous judicial system, most of the options have been exhausted, and the judges are now expediting the process," said Mike Pappas, CEO and president of the Keyes Company, covering the South Florida market. "The banks recognize the opportunity in this improving market and are aggressively trying to remove these properties from their balance sheets. It is encouraging, after seven years, to see the end near on this dramatic cycle." "The strength of the Ohio housing market shows in the overall year-over-year decrease in homes starting the foreclosure process," said Michael Mahon, executive vice president at HER Realtors, covering the Ohio housing markets of Cincinnati, Dayton and Columbus, all three of which saw an annual decrease in foreclosure starts in January. "The quickness at which mortgage servicers are willing to transition homes from the foreclosure process into their REO asset portfolio -- reintroducing such housing inventory as for sale in the open market -- is also a sign of a strengthening market with low available inventories and increasing prices across the state." A total of 48,838 U.S. properties started the foreclosure process in January, down 18 percent from a 17-month high in December and down 15 percent from a year ago following two consecutive months with year-over-year increases in foreclosure starts. 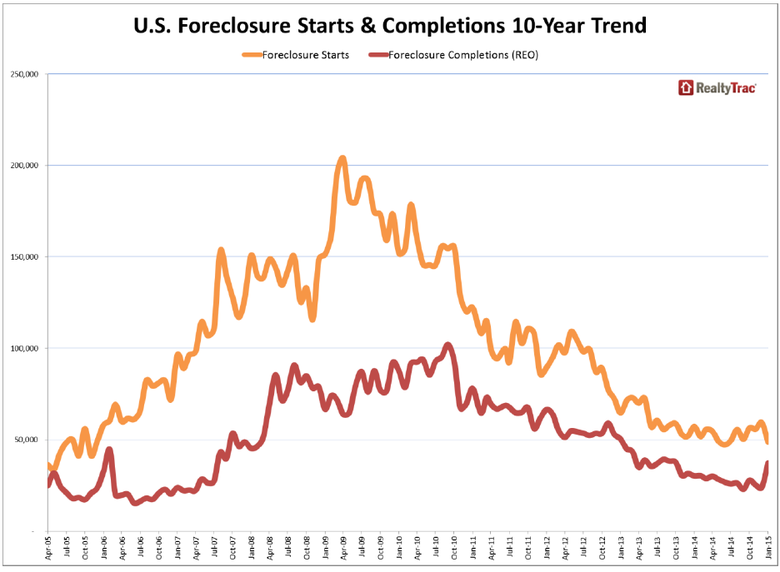 There were still 19 states where foreclosure starts -- which in some states are the scheduled foreclosure auctions -- increased from a year ago, including Nevada (up 255 percent), Indiana (45 percent) and Massachusetts (up 14 percent). 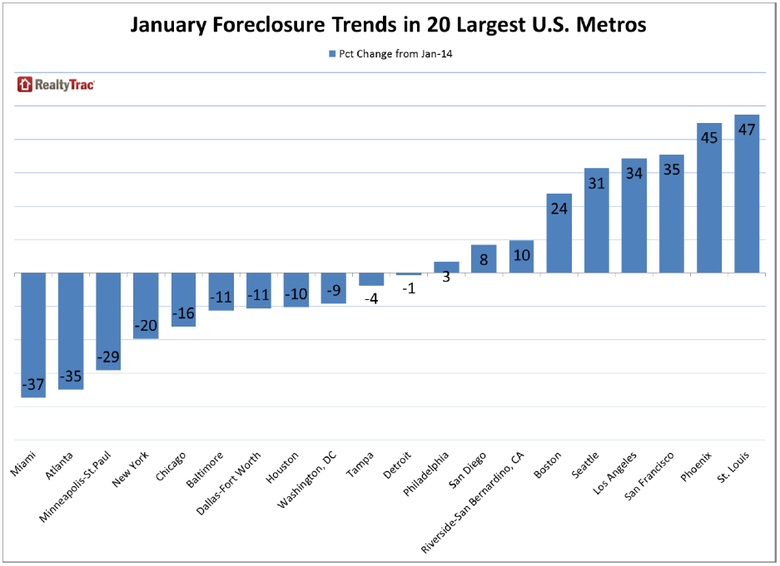 Nine of the nation's 20 largest metro areas posted year-over-year increases in foreclosure activity, led by St. Louis where overall foreclosure activity increased 47 percent from a year ago driven by a 51 percent year-over-year increase in scheduled foreclosure auctions. There were a total of 1,116 properties in the St. Louis metro area with a foreclosure filing in January, an increase of 52 percent from December. There were a total of 2,305 properties in the Phoenix metro area with a foreclosure filing in January, an increase of 104 percent from the previous month and up 45 percent from a year ago to a 20-month high. Scheduled foreclosure auctions - which are the first public foreclosure notice in Arizona and act as the foreclosure start -- increased 37 percent from a year ago, and bank repossessions were up 58 percent from a year ago in Phoenix. With 1,279 properties with a foreclosure filing in January, San Francisco foreclosure activity increased 49 percent from December and was up 35 percent from a year ago. 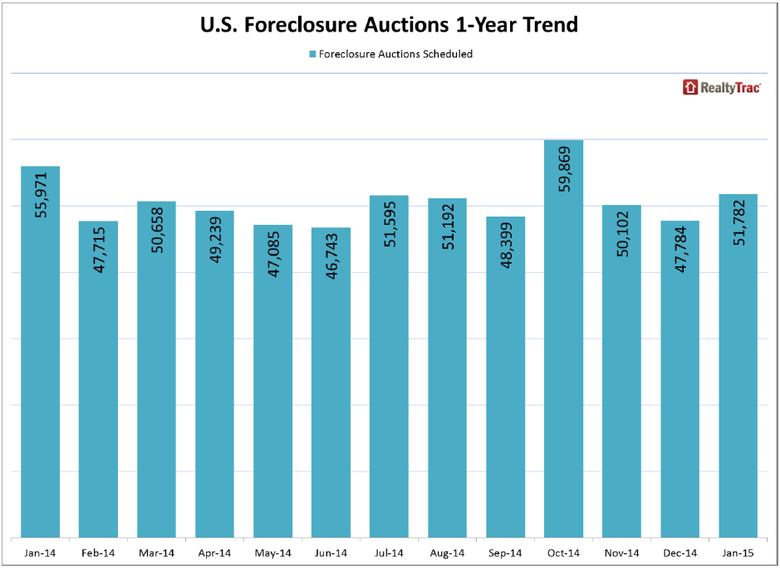 Scheduled foreclosure auctions increased 74 percent from a year ago and bank repossessions were up 62 percent from a year ago in the San Francisco metro area, while foreclosure starts decreased 2 percent from a year ago. There were a total of 5,663 properties in the Los Angeles metro area with a foreclosure filing in January, an increase of 59 percent from the previous month and up 34 percent from a year ago to a 22-month high. 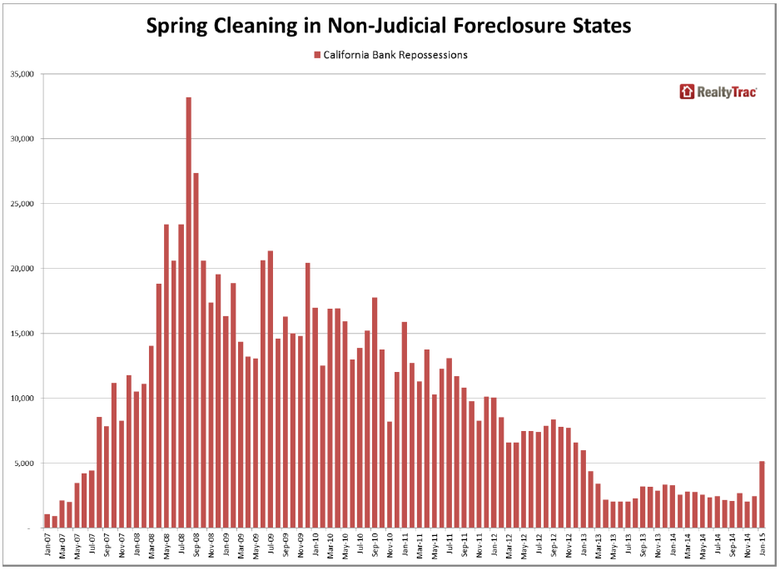 Scheduled foreclosure auctions increased 74 percent from a year ago and bank repossessions were up 102 percent from a year ago in the Los Angeles metro area, while foreclosure starts decreased 16 percent from a year ago. "Our agents' REO and distress business has wound considerably down over the last two years," said Mark Hughes, Chief Operating Officer at First Team Real Estate, covering the Southern California market. 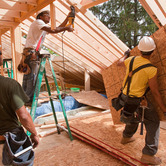 "Despite a bit of an extension to this wind-down process due to delayed actions created by the Homeowner Bill of Rights in 2013, we are preparing that this is really a final push to clear the decks of the a still disproportionate amount of distressed homes and finally bring the market back to a more stability." With 1,874 properties with a foreclosure filing in January, Seattle foreclosure activity increased 63 percent from December and was up 31 percent from a year ago to a 19-month high. Scheduled auctions -- which are the first public foreclosure notice in Washington and act as the foreclosure start -- were down 2 percent from a year ago, but bank repossessions increased 81 percent from a year ago in Seattle. Other major metros with a year-over-year increase in foreclosure activity in January were Boston (up 24 percent), Riverside-San Bernardino-Ontario in Southern California (up 10 percent), San Diego (up 8 percent), and Philadelphia (up 3 percent). Although down 21 percent from a year ago, Florida foreclosure activity increased 24 percent from December to January, and Florida posted the nation's highest state foreclosure rate in January: one in every 441 housing units with a foreclosure filing. Nevada foreclosure activity increased 38 percent from December to January, boosting the state's foreclosure rate of one in every 495 housing units with a foreclosure filing to second highest among the states, while Maryland posted the third highest state foreclosure rate -- one in every 611 housing units with a foreclosure filing -- despite a monthly and annual decrease in foreclosure activity. Other states with foreclosure rates ranking among the 10 highest nationwide in January were Illinois (one in every 684 housing units with a foreclosure filing), New Jersey (one in every 773 housing units), California (one in 780 housing units), Arizona (one in 822 housing units), Ohio (one in every 872 housing units), Delaware (one in every 879 housing units), and Washington (one in every 888 housing units). With one in every 338 housing units with a foreclosure filing in January, Atlantic City, New Jersey, posted the highest foreclosure rate among metropolitan statistical areas with a population of 200,000 or more. 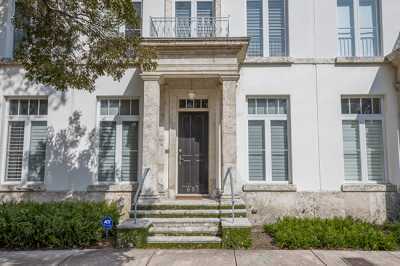 Eight Florida metro areas -- Ocala, Miami, Lakeland, Jacksonville, Tampa, Palm Bay, Orlando and Sarasota -- along with Las Vegas also posted foreclosure rates among the top 10 nationwide.